One of my favorite fertility supplements is evening primrose oil (aka EPO). I started taking the supplement on CD 10, and I noticed a greater amount and more fertile CM pretty much the same day. Women who are TTC use evening primrose oil because it is believed to improve the quality of cervical mucus (CM) and even make it more fertile. Many women suffer from either having not enough CM or the CM they do have is hostile to sperm. This can make it very difficult or even impossible to get pregnant because the sperm die before even getting close to the egg. EPO assists with the production of egg white cervical mucus (EWCM), the most fertile type of CM. EPO contains the omega-6 fatty acid called gamma linolenic acid (GLA). In the body GLA is converted to a hormone-like substance called prostaglandin E1. Prostaglandins have been shown to promote female hormonal balance and may support many different bodily functions, including moisturizing dry mucus membranes (ie cervical mucus!!) It also has anti-inflammatory properties and may act as a blood vessel dilator and as a blood thinner. These anti-inflammatory properties can help relieve aches, pains and even PMS cramps. In order to obtain the full benefits of taking EPO, you should take 1500 mg to 3000 mg of EPO every day. 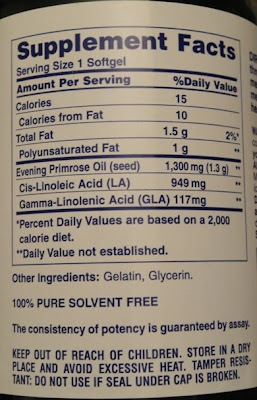 Also, some supplements may have 5% or less GLA and may only come in 500 mg pills; Puritan's Pride EPO has 9% GLA and comes in 1300 mg softgels that are easy to swallow. This way you only need to take 2 pills every day to know you're getting the right dose. They also offer 500 mg and 1000 mg softgels in case you do want to vary your dosage. Also, make sure to only take EPO from menstruation until ovulation! Prostaglandins can cause uterine contractions, so this is NOT SAFE to take after ovulation or during pregnancy!!! If you would like to take a fatty acid supplement after ovulation and during pregnancy, flax oil and some omega-3 supplements are safe. Make sure to check with your doctor before taking any supplements in pregnancy. Right now Puritan's Pride is offering a buy 1 get 1 free or buy 2 get 3 free sale! (If you buy more than 2 you do get more free; buy 3 get 4 free, buy 4 get 6 free, etc.) Also, get 10% off of your with coupon code "TAPDT10". 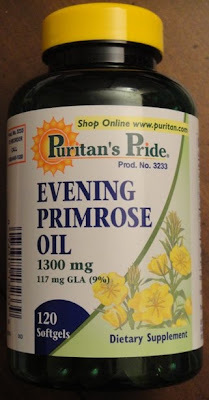 Win a bottle of Puritan's Pride Evening Primrose Oil! First, you need to publicly follow this blog and/or subscribe on Google Reader. Then comment here and tell me what other supplements you plan to take, currently take or took while TTC. This giveaway will close on February 27, 2010 at midnight. I am currently taking a prenatal vitamin, but if I don't get my BFP this cycle then I think I am going to take soy isoflavones to see if that won't help. A prenatal vitamin, DHA supplement (sometimes algal-900 and sometimes a "prenatal" DHA), and Gelatin. This cycle I tried taking soy isoflavones (80mg).